I Can Build, I Can Build! Whoa there Nellie…..before getting all carried away, there are 14 essential questions to have on your Building Department Checklist, in order to ensure structural portions of your new building process goes off without a hitch. 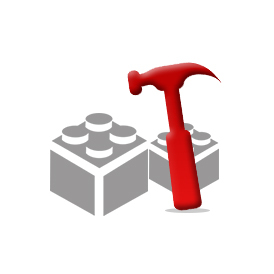 I will cover first seven today, finishing up tomorrow, so you have a chance to take notes, start your own home file folder of “what to do before I build”. Careful preparation will be key to having a successful post frame building outcome. #1 What are required setbacks from streets, property lines, existing structures, septic systems, etc.? Seemingly every jurisdiction has its own set of rules when it comes to setbacks. Want to build closer to a property line or existing structure than distance given? Ask about firewalls. 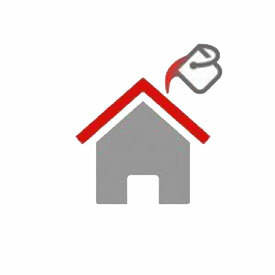 If your building includes a firewall, you can often build closer to a property line. Creating an unusable space between your new building and a property line isn’t very practical. Being able to minimize this space could easily offset the small investment of a firewall. As far as my experience, you cannot dump weather (rain or snow) off a roof onto any neighbor’s lot, or into an alleyway – so keep those factors in mind. #2 What Building Code will be applicable to this building? Also, every three years Building Codes get a rewrite. One might not think there should be many changes. Surprise! With new research even things seemingly as simple as how snow loads are applied to roofs…changes. Obviously important to know what Code version will be used. #3 If building will be in snow country, what is GROUND snow load (abbreviated as Pg)? Make sure you are clear in asking this question specific to “ground”. When you get to #4, you will see why. Too many times we’ve had clients who asked their building official what their “snow load” will be, and B.O. (Building Official) replied using whichever value they are used to quoting. Lost in communication was being specific about “ground” or “roof” snow load. As well, what snow exposure factor (Ce) applies where building will be located? Put simply, will the roof be fully exposed to wind from all directions, partially exposed to wind, or sheltered by being located tight in among conifer trees qualifying as obstructions? Right now will be a good time to stand at your proposed building site and take pictures in all four directions, and then getting your B.O. to give their determination of snow exposure factor, based upon these photos. #4 What is Flat Roof Snow Load (Pf)? Since 2000, Building Codes are written with flat roof snow load being calculated from ground snow load. Now design snow load has become quite a science, taking into account a myriad of variables to arrive with a specific roof load for any given set of circumstances. Unfortunately, some Building Departments have yet to come to grips with this, so they mandate use of a specified flat roof snow load, ignoring laws of physics. Make certain to clearly understand information provided by your Building Department in regards to snow loads. Failure to do so could result in an expensive lesson. #5 What is “Ultimate Design” or Vult wind speed in miles per hour? Lowest possible Vult wind speed (100 miles per hour) only applies in three possible states – California, Oregon and Washington for Risk Category I structures. Everywhere else has a minimum of 105 mph. Highest United States requirement of 200 mph for Risk Category III and IV buildings comes along portions of Florida’s coastline. Don’t assume a friend of yours who lives in your same city has your same wind speed. The city of Tacoma, WA has six different wind speeds within city limits! Vult and nominal design wind speed Vasd are NOT the same thing. Make certain to always get Vult values. #6 What is wind exposure (B, C or D)? A Building Department can add hundreds, or even thousands, of dollars to your project cost, by trying to mandate an excessive wind exposure. Once again, a good place for photographs in all four directions from your building site being shared with your Building Department. Some jurisdictions “assume” worst case scenarios. Meaning, your property could very well have all four sides protected and easily “fit” category B wind exposure requirements. However, your jurisdiction may have their own requirement for every site in their jurisdiction to be wind exposure C, no matter what. It’s their call. #7 Are “wind rated” overhead doors required? Usually this requirements enforcement occurs in hurricane regions. My personal opinion – if buying an overhead door, invest a few extra dollars to get one rated for design wind speeds where the building will be constructed. Truly a “better safe, than sorry” type situation. I’ve covered seven most important questions for your Building Department Checklist, and they really weren’t so difficult, were they? Come back tomorrow to find out the last seven! This entry was posted in Pole Barn Design, Building Department, Pole Barn Planning and tagged ground snow load, International Building Code, roof snow load, International Residential Code, snow exposure factor, Vult on January 30, 2019 by admin. Proper Engineering in post frame construction can not be overlooked. Alex Trebek has hosted Jeopardy!, the iconic daily syndicated game show, since 1984. With over 7,000 episodes aired, Jeopardy! has won a record 33 Daytime Emmy Awards. Some of you may even have tuned in for an episode or three. Okay, enough of my being snarky. The answer to Paul’s question should be clearly indicated on the engineer sealed plans for his building, along with the required connections from truss to header and header to columns. If somehow the engineer of record overlooked this critical element, he or she should be contacted immediately to provide the missing data. Even worse – maybe an engineer happened to not design the building, in which case CALL ONE NOW. But wait, there is more…..
Pf might be further reduced depending upon the roofing material (steel roofing being slick allows snow to slide off quicker), whether or not snow retention systems are present (which hold snow on the roof), as well as the roof slope. Mix them all together and the Sloped Roof Snow Load (Ps) is created. The dead loads imposed upon the roof also need to be added to the mix – the weights of trusses or rafters, purlins, roof sheathing, insulation supported by the roof system, roofing, truss bracing, ceilings are amongst some of the weighty culprits. Once all of these contributing factors are combined into a psf (pounds-per-square foot) load, concentrated loads are applied to each of the truss bearing locations along the header – these are based upon ½ of the truss span (including any sidewall overhangs) multiplied by the truss spacing and the applied loads. Not only does the header need to be verified for adequacy in load carrying capacity, but also limited in deflection. A sagging header can cause unsightly rooflines as well as preventing doors from operating correctly. Self-engineering is not a good choice – call your engineer….now! This entry was posted in Pole Barn Questions, Pole Barn Design, Building Department, Pole Barn Planning, Pole Barn Structure, Pole Building Doors, Trusses, Professional Engineer and tagged ground snow load, engineer of record, structural engineering, Jeopardy, truss header, snow exposure factor, thermal factor on December 7, 2017 by admin. 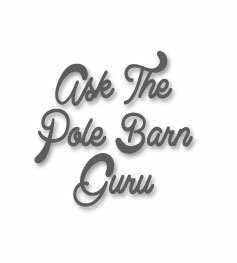 Dear Pole Barn Guru: Why Didn’t You get the Snow Load Right? 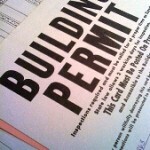 DEAR SNOWING: We’d all like to believe Building Department Plans Examiners are infallible. 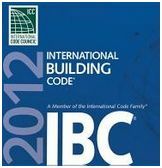 The reality is, the IBC (International Building Code) is a huge and complex document, which is further complicated by its references to numerous other outside documents. The agreed upon snow load which you purchased, was 35 pounds per square foot (psf) as a GROUND SNOW LOAD (or Pg). The Code references a document called ASCE 7-10 (for the 2012 version of the Code). ASCE 7-10 gives the formula to convert Pg to flat roof snow load (Pf). This formula takes into account factors such as Building Importance, if Building is heated or not and the roof’s exposure to the wind. The roofing material also comes into play with the heating or not of the building. Pf is also adjusted for roof slope, to get to the design sloped roof snow load (Ps). In your particular case, our office made a call to your plans examiner who has now been happily educated. DEAR CAUGHT: Sliding doors can be a challenge in wind storms. If they are not correctly designed, installed, or kept closed and latched during high winds, they can all too easily end up as an unusable pile of rubbish. Sliding door frames which are built either partially or all from wood, are especially susceptible to failure under load. Hansen Pole Buildings provides sliding door systems and components direct to builders and end users in all 50 states. The doors are designed for the average individual to successfully assemble and install their own sliding doors, by following the detailed step-by-step instructions. Call us and we will get you started on the path to replacing those doors. 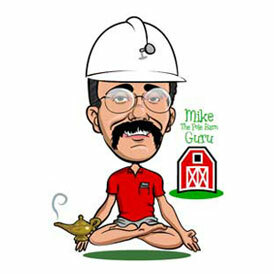 DEAR POLE BARN GURU: Hello, I am helping a friend build and install sliding doors on his pole building. The building is otherwise complete. The door openings are pretty much ready to go as I can see. They are framed in and the upper track is installed. So here I come with a pile of steel siding, steel studs, track for SIDS and button of doors, rollers (pendant) and screws… The instructions he has are very vague. Can you provide me with any plans, prints, instructions of any kind please? 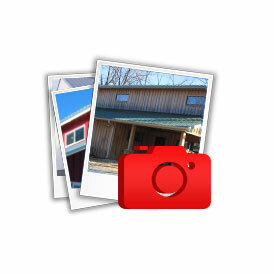 Also a photo or diagram of what the finished product should look like? DEAR WONDERING: While our sliding door systems are relatively simple for the average individual to install – having the detailed step-by-step instructions included in our Construction Guide, in hand would be a serious assist. The manual devotes 18 pages which include actual photos, as well as diagrams showing how to properly (as well as most quickly) assemble and install each component. Check the manual for these pages and then let me know if you still need help. Often people think the instructions come with the door and we’ve found having them in the Construction Guide makes them easier to find. This entry was posted in Pole Barn Questions, Building Styles and Designs, Building Department and tagged ground snow load, IBC, roof snow load, sliding door installation instructions, sliding door replacements on September 23, 2013 by admin. Yes I know, it is white (at least it starts out that way). From a design standpoint there are lots of things to know about snow loads. Cautionary Warning: The information contained herein is fairly technical in nature. We use ALL of this information in the design of your new Hansen Pole Building. Some clients will think this is all very cool, for others, it may cause your head to explode. I’ve been waiting three decades to pass along this information to a client, as I’ve always felt the understanding of it is pretty impressive. 1. GROUND SNOW LOAD (otherwise known as Pg). This is based upon a once in fifty year (probability of event greater than design loads happening is 2% in any given year). The use of unrealistically high Pg values causes issues with the design for drifting snow. The International Code specifies design snow loads are to be determined according to Section 7 of a document called ASCE 7. This document provides for all roof snow loads to be calculated from ground snow loads, however not every Building Department follows this procedure. When discussing snow load with anyone, it is crucial to have a clear understanding as to if the load is a ground or flat roof snow load. Pf is FLAT ROOF SNOW LOAD – If, as a consumer, your concern is snowfall and you want to upgrade the ability of your building to carry it, THIS is the value to increase. Often changes of five or 10 pounds per square foot result in minimal differences in cost. 2. Ce is the wind exposure factor for roofs. Most truss designers will use a Ct value of 1.0 or 1.1 in their designs. This results in a decrease in the ability of the roof to carry snow loads. These values should only be used when appropriate. 5. There is also a Minimum Roof Live Load (known as Lr) of 20 psf (defined by Code) (psf = pounds per square foot) which accounts for weights such as construction loads, when Pg values are very low. Lr is adjusted based upon the area the roof member supports and can be as low as 12 psf, in cases where a roof member supports over 600 square feet of area. Doing the math, it would be unusual, using the laws of physics, for Pf to be greater than Pg – however, some jurisdictions have established Lr values which defy the laws of physics (e.g. State of Oregon, where most of the state has a minimum Lr of 25 psf – exceptions being some locations along the coast, where it is 20). From Pf, Pr (Pressure on the roof) values are calculated depending upon whether the roof is a slippery surface or not, whether building is heated or not and the slope of the roof. The Top Chord Live Load (TCLL) of any roof trusses will be the greater of Pr or Lr. 6. Duration of Load (DOL) for Snow is typically 1.15. DOL can play a part in some snow areas, where the Building Official (BO) has made the determination snow will remain upon the roof for extended time periods. Some Examples of this include Higher elevations in Utah and Kittitas County, WA where the BO has declared DOL = 1.0. In areas with little or no snowfall (where Lr > Pr) DOL = 1.25. Yes, I know this is a lot of stuff to carry around in your head. Trust me, I know all too well, and my character analysis consistently reads “does not like numbers”! All these numbers and “code requirements” are why we not only ask, but insist you must take the page of our quote with the Design Criteria to your building department to get their blessing on it, and ask if there is anything else they require. With over 7000 building departments in the U.S., it would be the greatest feat on earth if we could keep up with all of them, and which ones change on any given day. My last caution is to be careful when asking your building department about snow load. Be sure you keep “roof” and “ground” snow loads separate. Because when it comes to getting your building designed, priced and finally plans signed off by your building department, there is a difference! This entry was posted in Uncategorized and tagged wind exposure, flat roof snow load, ground snow load, International Building Code on February 3, 2012 by admin.